Learn basic money management skills such as living within a budget and handling credit and debt. A solid financial foundation leads to a lifetime of financial success. College is a time of newfound freedom for many students. But that can spell trouble if that freedom meant being easygoing with their personal finances too. Students need to understand basic money management skills such as living within a budget and handling credit and debt. A solid financial foundation can lead to a lifetime of financial success. Financial literacy seems to be a difficult concept to grasp, but it is an important life skill that you can count on. There are a lot of baffling terms used in finance which discourages people to understand it fully. While financial literacy should have been taught to us by our parents, it’s the school’s responsibility to reinforce these learnings so kids can make better financial decisions as adults. However, the Council for Economic Education found out that there are only 17 out of 50 states that require classes on personal finance for their students. Why should it matter if we know what interest rates are, applying for loans, or why is it important to save for retirement? Financial literacy prepares us for crucial life decisions from understanding our student loans, how to save money for our future without being fooled with hidden fees, and most of all, how to be debt-free. Financial literacy might be your problem right now, but your problem is the nation’s problem, too. Now that Americans are now $1.28 trillion deep in student loan debt, it can affect the country’s economy. Once you graduate and have a job, you’ll be busy paying off your student loans instead of making big financial decisions like purchasing a house or a car. Because of that, certain business activities aren’t happening. You postpone making big purchases, you hold off on putting up a small business that would have opened job opportunities. Fewer people are spending money to run the economy, while more people are paying off their debts. Financial literacy goes beyond knowing mind-boggling terms or monitoring your expenses. It can help you make sound, realistic financial decisions that can affect your situation in the long run. Earning a college degree is one of the sound investments an adult must make in his life. Despite the rise of fees to invest for a college degree, making it through college life is yet another struggle. This is the stage in any student’s life that he learns to be more independent to make decisions of his own, to progress towards achieving their dreams. In college, you’re the one in charge of your finances. You might have your tuition taken care of, but you still need money for emergency situations. Setting aside a small amount of money is good practice, but it is practical to have your own banking account during your college years can help you conveniently pay anywhere. As soon as possible. Leaving for college next semester? Pack your things and visit your trusted bank to open an account. The sooner you establish responsibility, the sooner you develop the habit and discipline of managing your finances. How do I choose a bank account? Research and review. Many major banks offer student accounts that waive minimum deposit fees. Check for this feature as you research. Even if your can't access a free savings account, see if the checking accounts for students are free. You’ll also want to see how many branches and ATMs are near your school, what online banking features are offered, and if you can access a mobile app. Maintain a minimum balance Have your financial aid or income from a job deposited to your bank account to avoid other fees. Opt for e-statements Having your statements sent electronically can save you a few bucks per month and is environmentally friendly. Overdraft fees.Before making a transaction, make sure that you have a sufficient amount of money in your account, otherwise you may be charged for overdrafting. As student loans and tuition fees rise every year, it has become increasingly difficult to graduate college without owing money. Approximately 7 out of 10 college graduates leave their schools with an average of $33,000 deep in debt. Despite this staggering figure, a degree is still worth investing in, and a student loan can help you pay tuition fees and other expenses. Make the most out of your grace period. Gather details on your loans and understand its payment options. Choose your repayment plan wisely. Don’t forget your student loan interest during tax season. Apply for jobs that can help pay your debts or help in student loan forgiveness. Move to other places for reimbursement or to ease expenses. Avoid fees for late payment, allow auto-debit from your account. Continue to pay even during deferment. An alternate way to pay loans: uPromise. Avoid adding big debts on top of your existing loans. Majority of the student loans in the country are handled by the US Department of Education, so the process to repay student debt is simple. Other opt to avail loans from private lenders, and those are managed by various loan servicers. This can help you in rearranging the terms of your loan and there are different plans depending on the amount you owe, so choose wisely. Also known as a loan discharge, loan forgiveness will free you from your debts, given that you have gained certain qualifications such as volunteering for selected organizations, serving in the military, and more. Housing – There are different housing options that you can avail when you go to college. You can choose to live on or off campus, or if it’s possible, you can still live at home. The norm isn’t always the practical route. If you can share rooms with friends to lower the rates of renting a property, do so. Canvas and look for different price offerings before making a decision. Food – Prepare your own packed lunch. If it’s allowed to cook in your residence, we advise you to prepare your own food. You can control your diet, and may help you lose some extra pounds on the scale, too. On the other hand, limit merrymaking by learning to decline on every dine-out invitation. Instead of spending money for carbonated drinks, stick to drinking water. Transportation – Having your own vehicle in college can drain your purchasing power. There are a lot of things to consider when owning a car: gas, maintenance, and insurance. Use the public transportation, walk, or ride a bike to go from one point to another. As you get more used to commuting, you will find that these activities can help you lead a healthy lifestyle, too. Shopping – Learn to use coupons to save on groceries! If you need to buy something, stick to a list of your necessities. While it’s tempting to splurge a bit, you will find out that allowing yourself some room to spend can be a bad habit. Meanwhile, it’s easier to buy books via the Internet. Other students who no longer use the book you need can be found selling for a cheaper price than brand new books. Entertainment – Yes, college students deserve to have fun but keep in mind that the more you drink, the more likely you are to spend. Aside from partying, you’ll find that there are other activities you can join to make the most out of your college life. Before you purchase a book, look it up on the library first. You can always borrow a book instead of shelling out hundreds to read it. Cut the cable subscription as soon as you can to avoid incurring expenses. If you’re on a postpaid line, switch to prepaid. How do you prepare yourself for college? 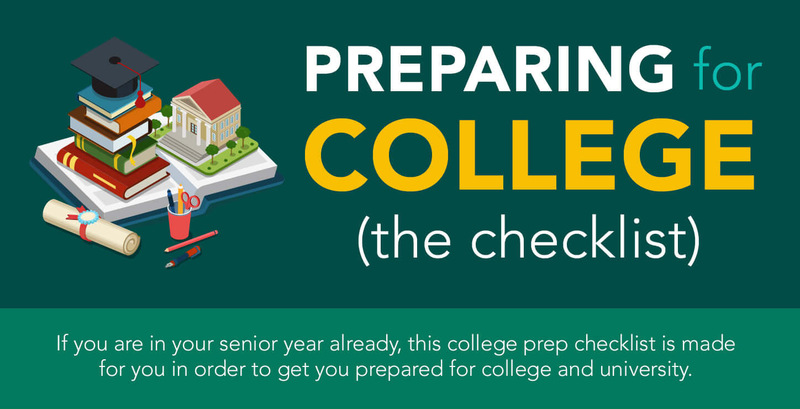 Here’s CreditLoan’s infographic checklist that can help you through your college life.